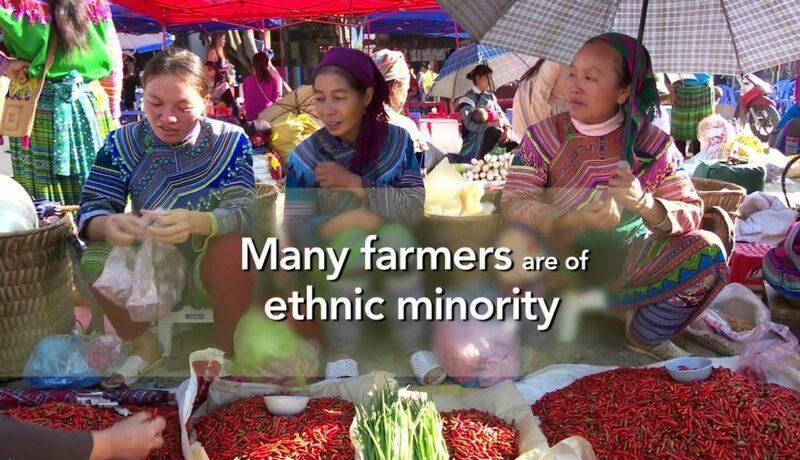 Late last year we reported on our work for the production of videos showcasing agricultural development in Vietnam. We are releasing two of those videos for 2016’s International Women’s Day. The first focused on an individual Vietnamese female scientist who has worked with tremendous focus in the lab and in the field in the male dominated discipline of forest science. She has achieved professional and personal success, as well as national impact, following support from the Crawford Fund and the Australian Centre for International Agricultural Research (ACIAR). The second describes an innovative project in Vietnam that is helping women and their families, from minority groups in impoverished North West Vietnam, through the improved production and marketing of indigenous and everyday vegetables. The films were produced by award winning documentary maker Sally Ingleton (360 Degree Films), and supported by the Crawford Fund, ACIAR and Global Food Studies at the University of Adelaide. You can view them on the Fund’s YouTube site. These are but two of many examples of agricultural development work underway that focus on women for impact. ACIAR is launching a special edition of its Partners Magazine, highlighting both these and a range of other projects and women for International Women’s Day, and it is available here. Acacia plantations are vital to Vietnam’s economy and to its smallholder farmers—the wood is used to make veneer, pulp and furniture and the country has 1.2 million hectares of acacia plantations, with most of these grown by more than 250,000 smallholders. Dr Ngheim Quynh Chi is a young female Vietnamese forestry scientist who is conducting cutting-edge science in the traditionally male dominated discipline of tree breeding. Her research, on polyploidy in tropical acacias, not only involves extensive time in the lab, but months each year in the field. While the Fund has provided support for Dr Chi through training, in 2007 Dr Chi received an ACIAR John Allwright Fellowship to do a PhD in acacia reproductive biology in Tasmania. Dr Chi and her team are developing new varieties to improve wood quality and safeguard trees against disease and environmental stress. “I feel very lucky to have a chance to work with Australian scientists, who support Vietnam to get more knowledge,” said Dr Chi. “There are many jobs for a woman scientist, so why not!” she says. “Dr Chi is now a role model for scientists, especially female scientists to follow,” said Dr Vo Dai Hai, Director of the Vietnamese Academy of Forest Sciences. View the video about Dr Chi’s success here. Vegetables unique to the North West region of Vietnam are usually sold at local markets, but are becoming increasingly popular in the larger and more formal markets in Hanoi. As explained in our video by the project leader—Dr Suzie Newman from Global Food Studies at the University of Adelaide—Vietnam’s north-west provinces face a dual need for improved vegetable production systems and access to markets. The ACIAR project highlighted in the video is working to achieve both goals in ways that reduce poverty and malnutrition. The key to success is women: working with women and the Vietnamese Women’s Union, which originally approached ACIAR to assist in the region on vegetables. The farmers have received training on improved methods for growing vegetables—like using greenhouses to grow out-of-season vegetables, and assisting rice farmers to grow vegetables when the season is unsuitable for rice production. The project is also helping the farmers create linkages with wholesalers and retailers, which provides new market opportunities in the more lucrative Hanoi markets. “If women in the north west focus on developing vegetable production on their farms, it will be the way for them to increase their income, reduce poverty and develop local community economies,” said Dr Nguyen Thi Mai Hoa, Head of the Department of Ethnic and Religious Affairs, Vietnam Women’s Union, who appears with project leader Suzie Newman and women farmers in the video that was filmed in the picturesque mountains of north west Vietnam. The North West Vegetable project will continue to grow and support more communities in the future to improve the livelihood of women farmers living in the mountains of North West Vietnam. View the video on the North West Vietnamese vegetable project here.